Actinidic archaea can modulate conscious perception. 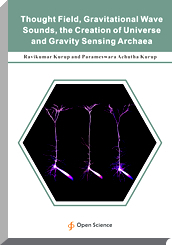 This led to the plausibility of gravity sensing brain actinidic archaea mediating consciousness and also consciousness as a feature of gravitational forces. Consciousness functions as the quantal observer creating the particulate world. Thus the thought field of gravity and the matter is unified. Thought underlies the world of matter. Gravity extends as gravitational waves made up of possible gravitons throughout the universe. Gravitational waves can form pressure waves which can create gravitational sounds. These thought sounds can undergo soni-luminescence creating photons and electromagnetic radiation the basis of the world of matter. Conscious perception involves three factors- perceptual synchronization, focused attention mediated by the reticular thalamic nucleus and working memory mediated by cortico-thalamo reticular reverberatory circuit. These structures are modulated by gravity as demonstrated by the classical pyramidal syndrome where the tone is more in the anti-gravity groups of muscles. Gravitational attraction by its nature can modulate perceptual binding and focused attention. Gravitation can also mediate working memory involving a fraction of a second structured in the reticular- thalamo-cortico-thalamic- reticular reverberatory circuit formation. The reticular formation can be considered as a primitive archaeal colony network of hypergravity sensing archaea of possible exobiologic origin.